...One Dalai Lama at a time. Let me get this straight, Barack H. Obama has to fix all the damage George W. Bush did to our national image? And yet Barack, a purportedly pious Christian, cannot show simple courtesy to a more supremely pious man (despite his faith) in the Dalai Lama? Is it because the Dalai Lama isn't muslim? Cause BO bends over backward to appease those of his own Muslim faith (sorry... Stephanopoulos DID corrected him on that). Here is a man exiled and persecuted... homeless, you might say... a man without a country. 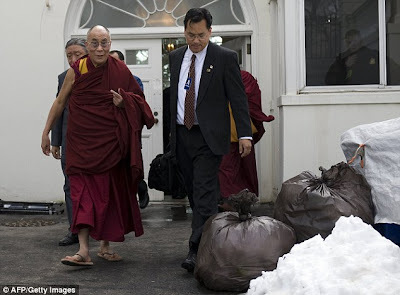 And yet the Christian Barack Obama can't show enough charity to let the Dalai Lama leave by the front door.... like he's some kind of an embarrassment... an untouchable. This is what comes from being a Liberal, for one, and owing far too much money to China for another-- and not all of that is on GW, not even half of it. I am yet again embarrassed by my president. Gays showering with straights? Absolutely. If President Obama, congressional Democrats, and homosexual activists get their wish, your son or daughter may be forced to share military showers and barracks with active and open homosexuals who may very well view them with sexual interest. Talk about creating a hostile work environment for people who practice normative sexuality! As former General Colin Powell observed in 1993 (before bowing to pressures of political correctness), "...it would be prejudicial to good order and discipline to try to integrate gays and lesbians in the current military structure." He compellingly argued against the completely bogus comparison between race and sexual preference: "Skin color is a benign, nonbehavioral characteristic. Sexual orientation is perhaps the most profound of human behavioral characteristics. Comparison of the two is a convenient but invalid argument." Not being the biggest fan of Colin Powell, I can't help but agree with him on this. Gays openly practicing their 'sexuality' in the disciplined ranks of our military? It's a recipe for disaster. There is nothing normal about homosexuality. It is a practice physically evident to be against nature; against design and purpose. I'm not going to argue the point either. Everyone who reads this blog knows my thoughts on homosexuality, so what's the point? What I will say-- or rather, lament --is that this is just another ideological waste of time coming from the Obama administration. I'd say he should concentrate on fixing the economy, but who is he kidding? He's never managed ANY business or payroll prior to screwing up the American economy. Why is it every sliver of 'Hope' and 'Change' he's offered thus far appeal only to the far left, the unions, moral reprobates and sexual deviants? E watched Paranormal Activity tonight. Paid 4.99 to Comcast OnDemand to watch, and simultaneously burn to DVD. This was one SCARY movie! I was totally freaked! I had to go online to assure myself that this movie was a fake. Having done that [as well as taking a dose of GABA and 5HTP] I'll now be able to get some sleep. Really! For a fake documentary I was on the verge of sleeplessness-- and I need all the sleep I can get going into this very long and tiresome week ahead. What made this movie so scary for me? I had the luxury of knowing nothing about the film prior to viewing. Even now knowing it's a fake, it's so well done it's still creeping me out. As he tells us he wants to reduce the dangerous budget deficit, President Obama brings to mind the hapless engineers at Toyota who find that their vehicles accelerate whether or not the driver wants them to. It appears that no matter how hard Obama jams on the brakes with his newfound commitment to deficit reduction (after almost doubling the deficit in one year), the level of red ink just seems inexorably to rise. The House voted yesterday to raise the federal debt limit another $1.9 trillion. Obviously, more fundamental change in the budget's engineering is needed. But, unfortunately, it is easier to recall a car than a president. Obama's announced intention to freeze 13 percent of the budget for three years is a relatively minor cut. It will trim the deficit by only 3 percent over the decade. 1) Stop the remaining $500 billion of last year's $800 billion stimulus package. 2) Refund to the Treasury the $500 billion in TARP funds repaid by the banks. Instead, he's merrily spending the remaining stimulus cash -- even though the first round failed to curb the recession, doing little more than protecting the jobs and pay of state and local government employees. The remaining money would do more of the same -- while also funding pork-barrel projects all over America. But only $300 billion of the stimulus has been spent. Why not call back the remaining $500 billion? Because Obama is still committed to the expansion of government spending. His promise of a (minor) freeze next year brings to mind an overweight friend's talk of the diet he'll go on -- even as he starts another banana split. Then there's the TARP funds. Most of the money laid out under President George W. Bush is being repaid by the banks that borrowed it -- but Obama is intent on intercepting the cash before it lands in the Treasury and sending it out the door again. He wants these funds for his second stimulus, relabeled as a "jobs bill." Some $30 billion is to go to small businesses for job creation, $30 billion for consumer credit and yet another $100 billion for more state and local aid -- that is, more protection for government workers. And none of that cash will ever come back -- even though it's TARP money that was initially appropriated for short-term lending, spending that the government would quickly recoup. At some point the left is going to have to come to grips with the amateur at 1600 Pennsylvania Avenue. The template used by media and pundits alike to downgrade any accomplishments by Bush must also be applied to Obama. Fudging the unemployment figures doesn't achieve anything but a false hope of an economic spring thaw. Obama's groundhog has seen its own shadow, yet in typical fashion the media has campaigned their continual support of their amateur-- they've covered up the "shadowy" truth. Obama's idea of economic recovery is more government intervention in the form of new and inventive taxes. The stimulus hasn't worked; it hasn't even been fully spent. Remember, much of the stimulus is slated for next year to pad his own chances of reelection in 2012. It appears on the surface that what he proposes is both simple and logical, to say nothing of moral. But when you dig deeper. His State of the Union was liberally peppered with inaccuracies and outright lies. He spends much of his time castigating and/or attacking Republicans, Democrats, the American people, Rush Limbaugh, Fox News... is there anyone this man doesn't hate? It is becoming more and more clear that he is out of his depth. The Peter Principle personified. It was commented at American Descent that Bush failed at every business venture he set his hand to, that this somehow mitigates the problems Obama is facing. Well this is absurd. Especially in light of the fact that our current President never ran even ONE business venture. Success is born of failure. Few people, if ever, achieve success the first time around. Barack is an obvious exception with one caveat: he's succeeded in reaching the top without having to demonstrate his ability to succeed in the position. He knows how to communicate, presuming a teleprompter is handy. He's quick with wit and innuendo, he has a charming smile, but he's obsessed with himself and his own thin accomplishments. What he has managed to do is ensure more misery for Americans. Which reminds me of the following tale from the Bible. Obama is following in the footsteps of some very old shoes. Replace "Rehoboam" with "Obama" and you have a series of events separated by thousands of years appearing to mirror each other. And Jeroboam and all the congregation of Israel came, and spake unto Rehoboam, saying, Thy father made our yoke grievous: now therefore make thou the grievous service of thy father, and his heavy yoke which he put upon us, lighter, and we will serve thee. And he said unto them, Depart yet for three days, then come again to me. And the people departed. And king Rehoboam consulted with the old men, that stood before Solomon his father while he yet lived, and said, How do ye advise that I may answer this people? And they spake unto him, saying, If thou wilt be a servant unto this people this day, and wilt serve them, and answer them, and speak good words to them, then they will be thy servants for ever. But he forsook the counsel of the old men, which they had given him, and consulted with the young men that were grown up with him, and which stood before him: and he said unto them, What counsel give ye that we may answer this people, who have spoken to me, saying, Make the yoke which thy father did put upon us lighter? And the young men that were grown up with him spake unto him, saying, Thus shalt thou speak unto this people that spake unto thee, saying, Thy father made our yoke heavy, but make thou it lighter unto us; thus shalt thou say unto them, My little finger shall be thicker than my father's loins. And now whereas my father did lade you with a heavy yoke, I will add to your yoke: my father hath chastised you with whips, but I will chastise you with scorpions. For Bush most certainly added to our burdens in the form of TARP-- championed and supported, by the way, by many on the Left including Obama and the media. But now Obama would squander the returns from TARP to foolishly spend on supporting and growing government. The government didn't elect Obama to manage it (especially seeing as how he's never managed anything! ), he was elected to lead the country in his constitutionally mandated duties... no more. Saying, "Bush did it too" is not excuse enough to allow the same ol' same old to continue. That Bush did wrong is not carte blanche for Barack to do the same. At some point we have to decide, as the American people, whether we want to spend our and our children's economic fortunes in the barren halls of penury. At some point we have to say enough is enough, and force our elected "leaders" to represent the people who sent them to Washington. Which, by the way, is a seat of government, not a throne room for liars, thieves, and fief-lords. We are Americans; we are not subjects to any king or lord. They work for us, and need to be made to recognize OUR supremacy. Lamenting Washington's "deficit of trust," Obama gave an example of the reason for it when he brassily declared: "We are prepared to freeze government spending for three years." This flagrant falsehood enlarges Washington's deficit of truth: He proposes freezing some discretionary spending, about one-eighth of government spending. Obama's leitmotif is: Washington is disappointing, Washington is annoying, Washington is dysfunctional, Washington is corrupt, verily Washington is toxic — yet Washington should conscript a substantially larger share of GDP, and Washington should exercise vast new controls over healthcare, energy, K-12 education, etc. Talk about double speak! The bible says, a double-minded man is unstable in ALL his ways. Thank-you Barack for beautifully illustrating this. One quote I find immensely intriguing. There is so much riding on this statement-- implications, challenges, instructions. What does this statement say to you, and how does it change the way you think about yourself, if at all?